Spin into Spring with Evening Power Pedal & Spin Express! Evening Power Pedal – Leave the stresses of the day at the door and burn off steam with some serious spinning! Tuesdays/Thursdays, 5:15-6:05 p.m. in the SDC Studio. Spin Express – Rev it up and burn calories fast in this 40-minute power spin class! Tuesdays/Thursdays, 12:10-12:50 p.m., & Saturdays, 8:00-8:50 a.m. in the SDC Studio. For more information or to register, visit Spin Programs. Turn your world topsy turvy with the Yoga Arm Balances & Inversions Workshop! Cultivate courage for including arm balances and inversions in your home practice. Instruction, demonstration and assistance throughout each posture will be provided. Open to those who have a comfortable yoga practice, healthy shoulders, neck and back, and a spirit of curiosity! Date/Time: Sunday, March 29, 4:00-5:50 p.m.
For more information or to register, visit Arm Balances & Inversions. 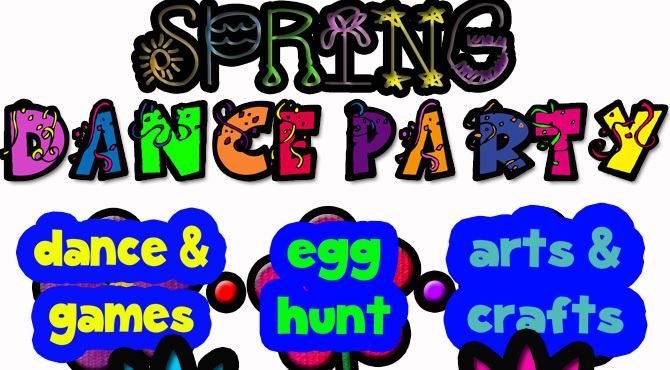 Join Michigan Tech Youth Dance as they celebrate Spring! 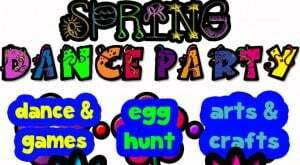 Arts & crafts, an Easter Egg Hunt, and fun dance-related games await kids ages 1-12. Get ready to dance the afternoon away! For ages 1-12 (ages 1-5 with parent). For more information or to register, visit www.michigantechrecreation.com. Unique Community Programs Classes on the Horizon! Michigan Tech Community Programs is proud to bring you more ways to commit to be “HuskiesFit” in 2015! Celebrate Spring at the Yoga Equinox Gathering Saturday, March 21, or work on body awareness and relaxation with Mindful Hatha Yoga beginning Friday, March 20. Looking to shake up your fitness routine? How about Belly Dance for Fitness! Learn to shake, shimmy and roll in this energetic cabaret-style belly dance class. Part brain-teaser, part isolation workout – you’ll still be able to smile while learning demanding techniques and moves. Class begins Saturday, March 21. Learn to fly in Intro to Aerial Silks! Get fit and have fun doing things you never thought you could do! Come see for yourself what this amazing way to train is all about. A challenging workout focused on the upper body, core strength and flexibility. Learn new and diverse techniques for climbing and moving the body on the silks. Class begins Saturday, March 21. Register now and take advantage of available savings options such as SDC member discounts and TechFit. For more information on these adult programs and more, visit www.michigantechrecreation.com. 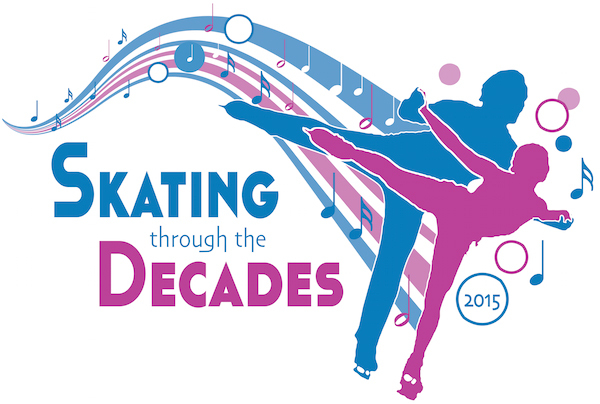 The Copper Country Skating Academy announces its Spring Ice Show, “Skating through the Decades”! See youth & adult local figure skaters, guests from Michigan Tech Learn to Skate & Michigan Tech Figure Skating Club perform. Show Dates: Saturday, March 21, 4:00 p.m. & Sunday, March 22, 2:00 p.m.
Tickets: Adults $10, Youth $5. Available at the SDC Ticket Office on the day of the event. For more information, visit Skating through the Decades. Last Chance! Register now for the Doghouse 3-on-3 Basketball Tournament! Registration for the Doghouse 3-on-3 Basketball Tournament closes this Friday, April 10! The Doghouse Classic is an original Michigan Tech event which saw its beginnings 25 years ago under the direction of Kevin Borseth, head women’s basketball coach at the time. The Doghouse Classic was a long-standing tradition in the Houghton and Hancock area up until the last tournament took place in 2007. On Saturday, April 18th, the tradition will be reestablished. Michigan Tech Recreation is excited for the opportunity to host the tournament and bring back the Doghouse! Divisions this year will include: boys’ and girls’ grades 4-8, JV, Varsity, Men’s Open and Women’s Open. Cost is $80/team of 4 players. For more information or to register for the Doghouse 3-on-3 Basketball Tournament, visit Doghouse 3-on-3. 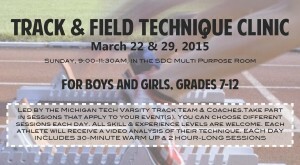 The Michigan Tech Track and Field team and coaches will host a Technique Clinic for boys and girls grades 7-12 on March 22 and 29 at the Student Development Complex Multi Purpose Room. The sessions will run from 9-11:30 a.m. and include a 30-minute warm-up and two-hour technique session. Cost is $20 for 1 session or $35 for both sessions per participant or coach. Pre-registration is required. Deadline to register is March 20. 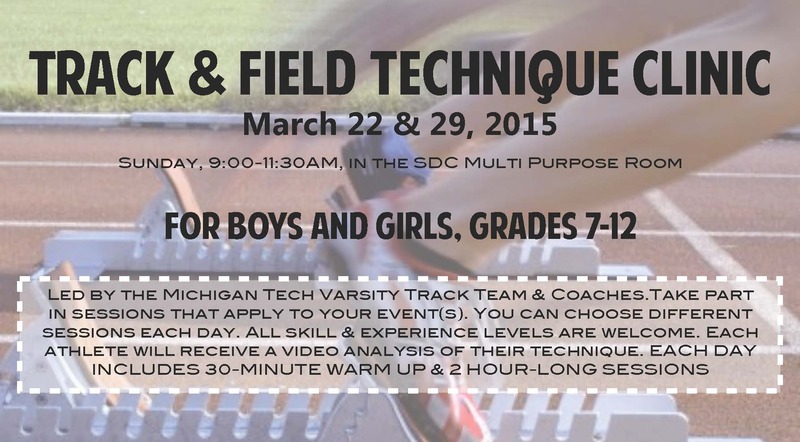 For more information, visit Michigan Tech Track & Field Technique Clinic, or contact Kathy Wardynski, Michigan Tech sprints/hurdles/jumps coach, 906-370-2917 or email kmwardyn@mtu.edu. 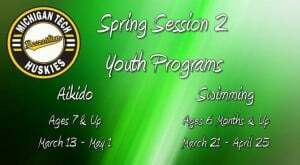 Spring Session 2 Youth Aikido & Swimming Classes Starting Soon! 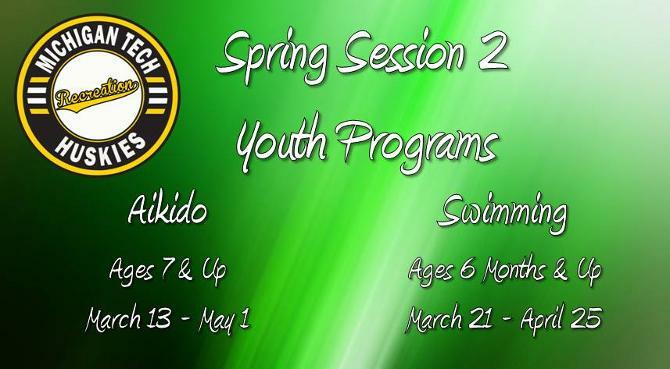 Spring Session 2 Youth Classes in Aikido and Swimming will begin soon! Register now and take advantage of available savings options such as SDC member discounts and TechFit. 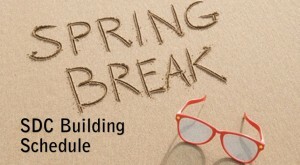 In honor of Spring Break, the SDC will observe special hours Saturday, March 7 through Saturday, March 14. 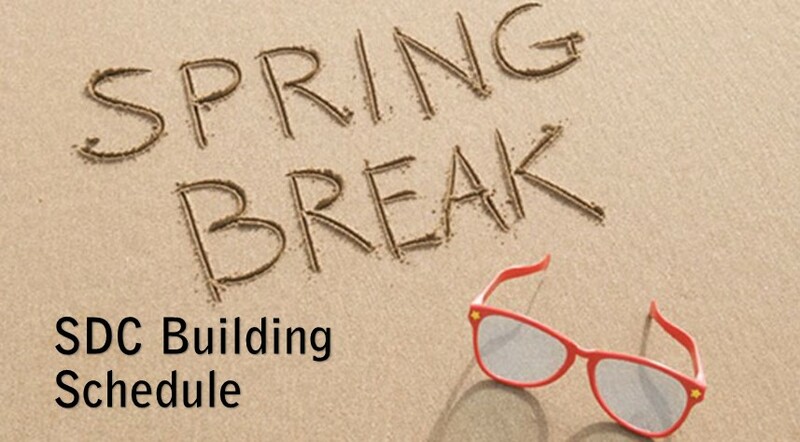 For more information, visit SDC Spring Break Hours. For all the latest Recreation, Community Programs, and Sports Camps news, visit michigantechrecreation.com. Commit to be HuskiesFit! Reminder: Register for the McKay 3-on-3 Hockey Tournament! 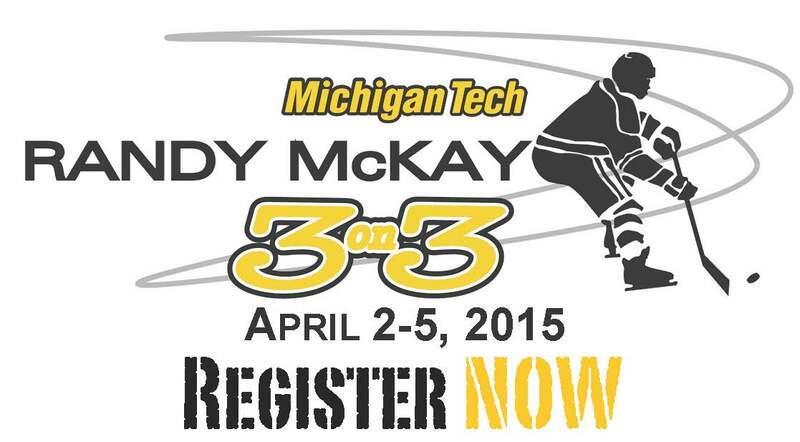 Registration continues for the McKay 3-on-3 Hockey Tournament, which will be held April 2-5, 2015. The tournament is named after Randy McKay. McKay played at Michigan Tech from 1984-88, and went on to play professionally for the New Jersey Devils (winning two Stanley Cup wins) the Montreal Canadiens, the Dallas Stars and the Detroit Red Wings. The tournament is a great time for competition and honing skills. The program accommodates all age groups and all skill levels. The 3-on-3 is a unique brand of hockey. Play runs concurrently on each half of the ice surface (about 100 feet by 85 feet), which allows for quick games and fast action. This year’s divisions are: Developing Mites, Mites, Squirt House, Squirt Travel, PeeWee House, PeeWee Travel, Bantam, High School/Midget, Men’s Open and Women’s Open. The cost is $200 for teams and $30 per goalie. Deadline to register is March 20. For more information or to register for the McKay 3-on-3 Hockey Tournament, visit McKay 3-on-3.